India's largest Landline service provider, Bharat Sanchar Nigam Limited (BSNL) introduced charges for shifting and name transfer of landline telephones in rural and urban areas. These charges are applicable on PAN India basis across all telecom circles. Earlier, BSNL charged Rs 600 per shift, and later the PSU has decided to the withdraw charges for shifting and name transfer at any where across the country. 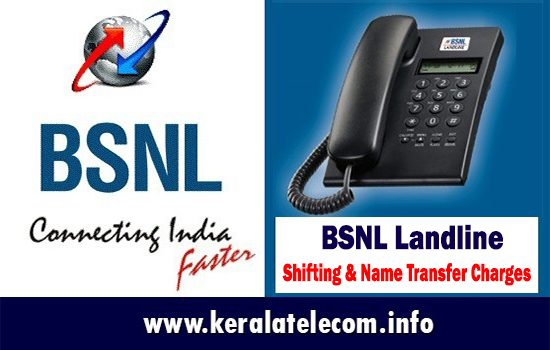 Now based on the market conditions and the operational cost involved, BSNL has decided to introduce charges for for Name Transfer at Rs 200 per occasion and Shifting of Landline connection at Rs 300 per shift. Dear readers, please share your views and opinions about BSNL Landline / Broadband Services via comments with us. How many of you are currently using BSNL Broadband Services?